Through late-December and the early part of January, the Carmel High School varsity basketball team had a number of players diagnosed with a highly contagious skin infection—impetigo—forcing players to sit out of practices and games to contain this condition and prevent it from spreading. A bacterial skin infection, impetigo is most common in children, causing irritated, sensitive, red sores which can easily be broken, allowing them to release fluid and rapidly spread to others with open wounds such as cuts or burns. The first Carmel player who caught the infection believes that he contracted it during a game because areas of the body most likely to be affected are ones subjected to high friction. Studies show that athletes who partake in contact sports are more likely to be at risk. The problem for the team’s situation was that, at the time, the infection was not maintained. “When we played Menlo Atherton at San Benito County, an opposing player scratched me, possibly with a dirty finger nail, and that is how I got it,” sophomore shooting guard Joe Garello speculates. Garello, unaware of the risks from the contagion, did not think much of the lesions on his arm until after they became more serious. 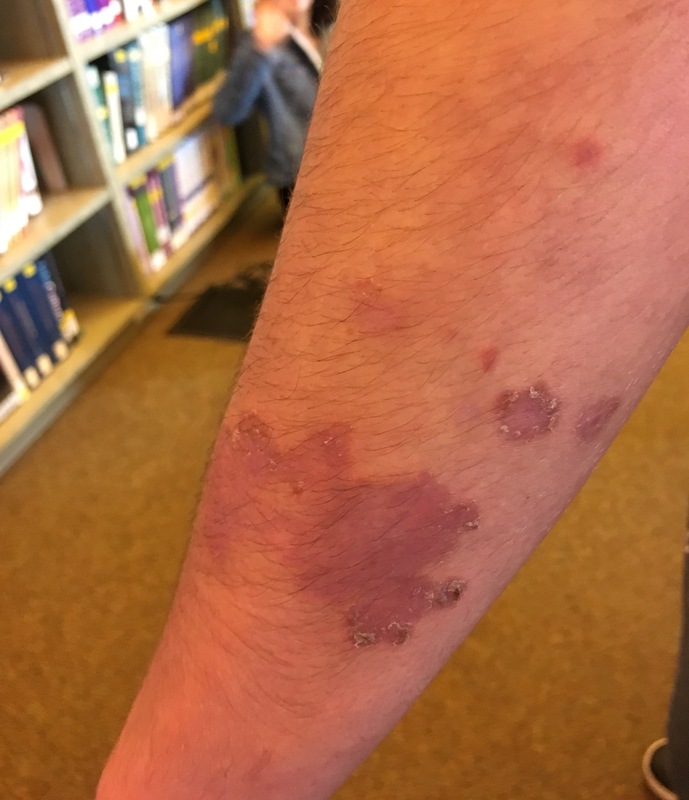 “I noticed the rash a week after I was scratched, but I did not get it checked out by a doctor until three weeks later,” he says. Carmel coach Kurt Grahl was not initially informed of the number of players diagnosed because they themselves were not aware of the severity of the condition, but once the situation was called to his attention, he took matters into his own hands for the benefit of the team. As evident by the first few weeks of the spreading, infections like this are especially hard to track for the administration when they are kept secret. “Unfortunately, if a player does not disclose an illness, does not seek medical attention for it, or does and does not disclose that to a coach, the coach or school would have no way of knowing,” CHS athletic director Golden Anderson says. Once Garello met with his doctor, he was prescribed antibiotics and cleared a week later, but the infection did not end there; it spread to other members of the team. “I woke up one morning and noticed a minor rash [in late December],” junior point guard Antonio Giangiorgi says. Giangiorgi first caught the rash on his left arm, but shortly after, the lesions spread to his face and chest. The point guard missed a game due to impetigo’s ability to be easily spread through skin-on-skin contact, but he is now cleared and playing once again. Other players also diagnosed did not have as severe cases as Giangiorgi’s, but were still touched by its superficial and troublesome effects. “It luckily does not affect my playing time, but it looks strange” junior forward Kevin Cook says. Cook, like his teammates, was taken aback by the unusual appearance of the rash and the fact that it did not go away on its own. He went to a dermatologist to be checked out and was then prescribed antibiotics as well. Despite their clearance from the viral infection, some players still have the visual remnants of impetigo left behind on their bodies. “I noticed it a week before Christmas, and I was prescribed with antibiotics and creams to put on the affected areas, but there is still the appearance of the rash,” junior forward Dylan Houpt says. Though he no longer has an active infection, Houpt still has the blisters left behind on his arm for the time being; although it does not influence his athletic performance or his health, he still finds it concerning for aesthetic reasons. “It had been treated so luckily it has not affected the season other than the forefront that we needed to address the issue,” Grahl says. The outbreak has not deterred the team from keeping a.500 record and en route to a CCS berth. Through Jan. 22, the varsity team was 3-2 in the league and 8-7 overall; their next game is Monday, Jan. 30, at King City.